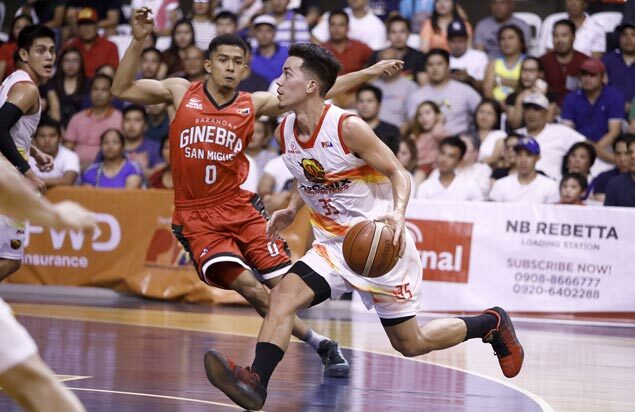 PHOENIX was all business on April Fools’ Day as it held off a Barangay Ginebra side that played all-Filipino down the stretch, 94-91, on Saturday night in Davao to get back on the winning track in the PBA Commissioner’s Cup. Matthew Wright typified the Fuel Masters’ demeanor, firing a career-high 27 points after going scoreless in his first game back last Sunday, and capping off his impressive play by calmly sinking two charities that proved to be the insurance points for his team. Before that, Jameel Mckay scored on an off-balanced lefty putback off a missed trey by Norbert Torres, putting the Fuel Masters up for good as they bounced back after losing their last two games by an average of 22 points and improved to an even 2-2 win-loss card. The Gin Kings played gallantly without Justin Brownlee in the last seven minutes after their import was forced to go out with a minor injury, before falling short in their matchup in front of a sellout crowd at the University of Southeastern Philippines gym in Obrero. Jervy Cruz spearheaded the all-Filipino stand, scoring all but two of his 10 points in the final frame where the Gin Kings engaged the Fuel Masters in a see-saw battle, getting their last taste of the lead at 91-90 after Japeth Aguilar buried a midrange jumper with a minute and 45 seconds left. Mckay, though, turned garbage into gold as he scored off the offensive rebound to regain the lead for Phoenix, before the Gin Kings committed a turnover as LA Tenorio couldn’t catch a low pass from Joe Devance, setting up Wright’s free throws. Wright completed his brilliant performance with three triples, six boards, three assists, and one steal against six turnovers in 29 minutes, while Mckay controlled the boards with 28 rebounds along with 15 points, three steals, two blocks, and two assists in 40 minutes of play. Aguilar and Devance led the Gin Kings with 15 points each, while Tenorio added 13 points, four assists, and four boards as Brownlee chipped in 12 markers, four boards, four assists, three steals, and two blocks, before going out after less than 30 minutes on the court.